Some of the action at the Soul Surf event. Photo by Zach Epstein. 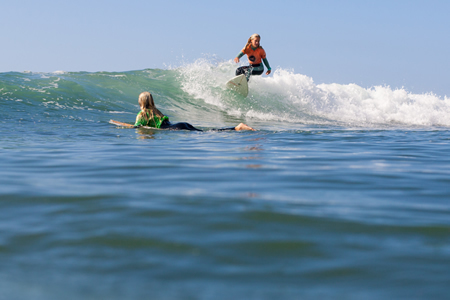 Under sunny skies with fun, shoulder high surf, the Soul Surf competitors were treated to a classic day of surfing at one of California’s legendary point breaks. The series offers divisions for kids as young as 5 to seniors. Several Camp Pendleton kids participated as special guests. Groms heard a gospel message by Jake Saenz, junior surfer from Huntington Beach who aspires to be a pastor. U7 Microgroms: Lenin Ferguson, Landon Hutcheon, Petey Romaniuk, Hayden Suess, Milo Eli ­ McGregor and Georgia Diaz. U9 Microgroms: Eli Park, Hudson Saunders, Shane Stacy, Jax Hutcheon, Kaden Horing and Charlie Stevens. U10 Boys: Lucas Owston, Hudson Saunders, Brady Hurley, Kaden Horing, Jax Hutcheon and Kadin Naber. U10 Girls: Hayden Suess, Lylah Collins, Hannah Dunfee, Lauren Anderson, Juliana Romniuk and Ella Randolph. U12 Boys: William Mitchell, Lucas Owston, Raiki Nishida, Evan Gallen, Nico Coli and Tyrone Fomenko. U12 Girls: Jenna Clark, Hannah Dunfee, Lylah Collins, Noelle Walker, Lauren Anderson and Reese Hartnett. U14 Boys: Griffin Foy, Sebastian Mendes, Trey Lockhart, Ryan Martin, Keanu Igarashi and Jett North. U14 Girls: Kelly Smith, Jamie Linnes, Gracie Fink, Claire Kelly, Kennedy Hurley and Destiny Thompson. U16 Boys: Ryan Martin, Trey Lockhart, Griffin Foy, David Economos, Jeremy Shutts and Jonah Clark. U16 Girls: Kalohe Danbara, Maile Davis, Gracie Fink, Claire Kelly, Kelly Smith and Lola Fisher. U18 Boys: Kei Kobayashi, Sage Burke, Sebastian Mendes, Nicholas Holdman, Parker Swoish and Gavin Doan. Awesome! See you at the next comp!